Thief & Liar? - ...Story Published in Isreali Newspaper Accra Hearts of Oak's striker, Bernard Dong Bortey has denied reports linking him to a watch theft during his trial stint in Israel some weeks ago. Bortey, whose career has taken a dip in recent times, is alleged to have stolen a watch and an unspecified amount of money, which he deposited in Ghanaian player, John Paintsil's locker (READ). 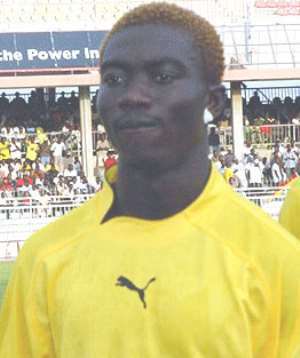 The Hearts striker was lodging with the Ghanaian international during his trial period. According to JoySports correspondent, Kojo Frimpong, who spoke to Bortey in Tunis, the Hearts player has rubbished reports over the alleged theft case. But Bortey, who finds the story ridiculous believes its one masterminded by John Paintsil. Also JoySports gathers that the investigations are underway to ascertain the truth. Hearts management and coach Ernst Middendorp are reported to be prepared to clear the player if the story is found to be untrue or sanction him if found culpable.